Learn how to cross stitch on crochet including how to design your own cross stitch graphs. 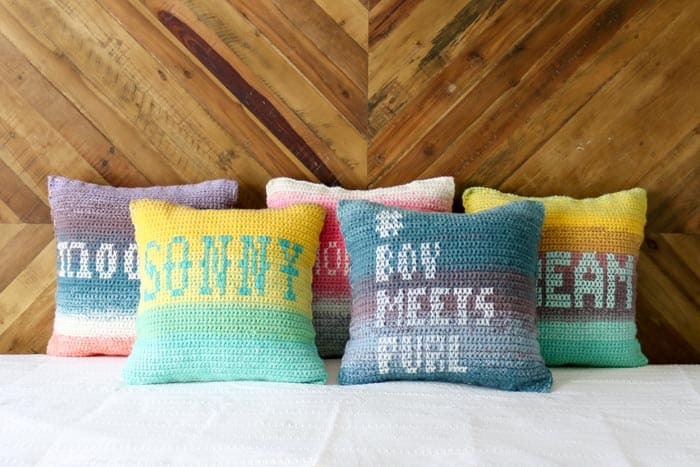 Personalize crochet pillows, hats, bags–and pretty much everything else! Free cross stitch graphs below. This cross stitch on crochet tutorial is part of a collaboration with my friends at Lion Brand Yarn. This post contains affiliate links. Today, I’m going to share everything I learned about cross stitching on crochet–which was a lot because I knew nothing when I started this! 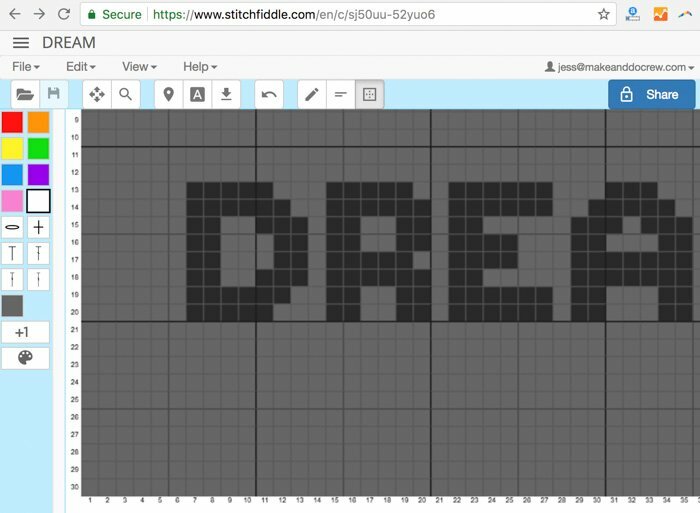 And since the best part about this technique is being able to personalize a crochet project, I am sharing how to design your own cross stitch patterns using a super helpful website called StitchFiddle.com. 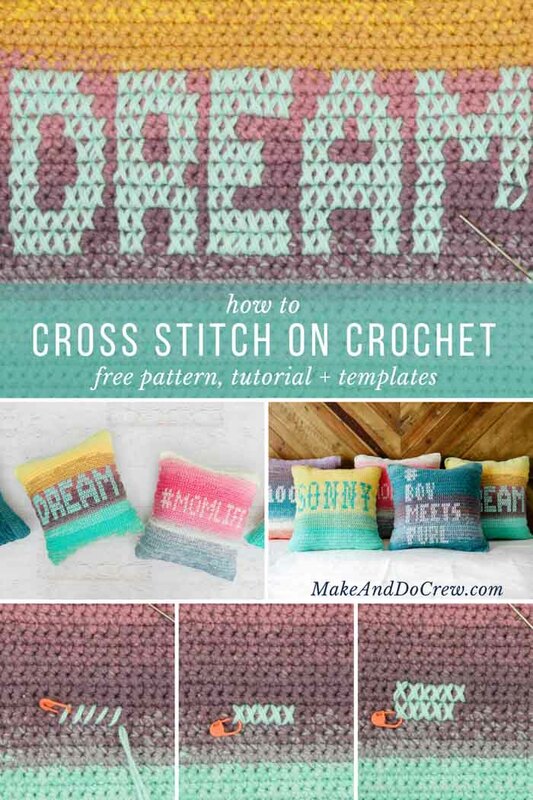 Sorting out the size of your crocheted fabric and designing the cross stitch graph are best done hand in hand, so my suggestion is to read through this entire tutorial before getting started. It’ll give you an idea of the big picture and then you can dive into applying the step-by-step details. 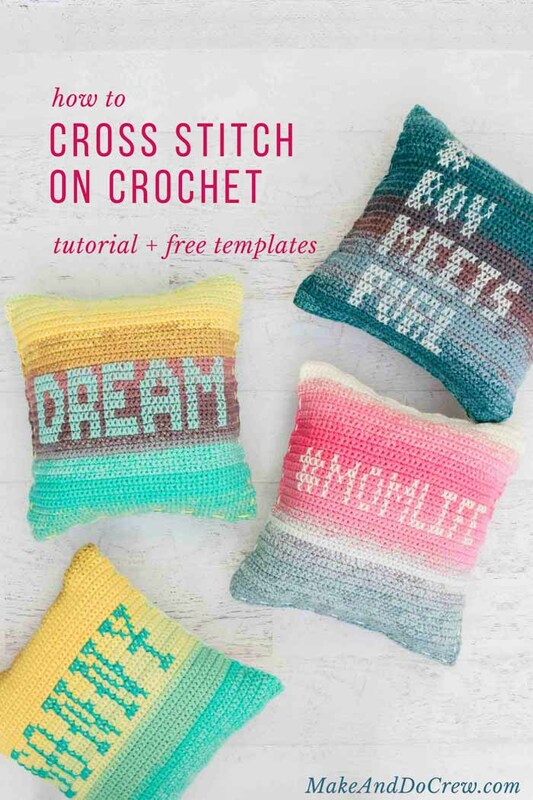 If you’re interested in getting the free cross stitch patterns for the #momlife and DREAM pillows, enter your email below and you’ll gain instant access to them and other free exclusive crochet pattern PDFs in the Make & Do Crew vault. I know, I know, nobody likes to swatch. But if you’re making anything that you want to be a specific size, you’ll want to plan out your design and the size of your crotchet fabric piece at the same time. The crocheted fabric that you’ll cross stitch on should be fairly tightly woven. This means you’ll want to use a smaller hook than usual for the weight of yarn in order to make your stitches tight. 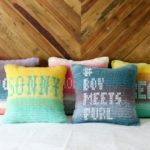 See this free ombre pillow pattern for the exact details on replicating the pillows pictured here. Crochet a small swatch, like 10-20 stitches by 10-20 rows. I’ve found it most helpful to use single crochet stitches to create my cross stitch crochet fabric as they’re fairly square and easy to see, similar to the grid on traditional cross stitch fabric. 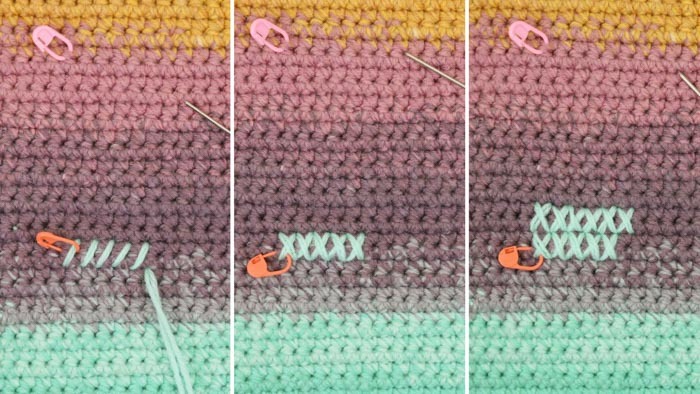 Measure your swatch so that you know how many stitches fit into one inch and how many rows fit into one inch. Use this information to figure out how many stitches across and rows tall you’ll need to work to achieve the size fabric you need. (For example, if [4 stitches = 1″], then you’d need [4 x 15 = 60 stitches] to make a piece of fabric that’s about 15″ across. 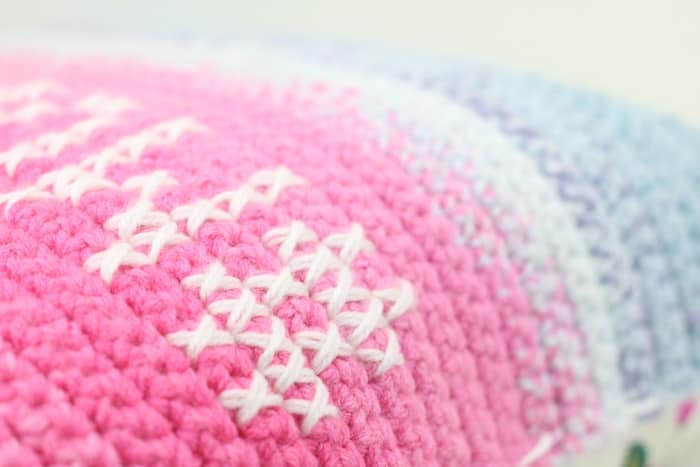 Simultaneously, be thinking about your design, because the graph pattern of the design and the crochet fabric piece need to work together to create the correct number of cross stitch “holes” for your project. 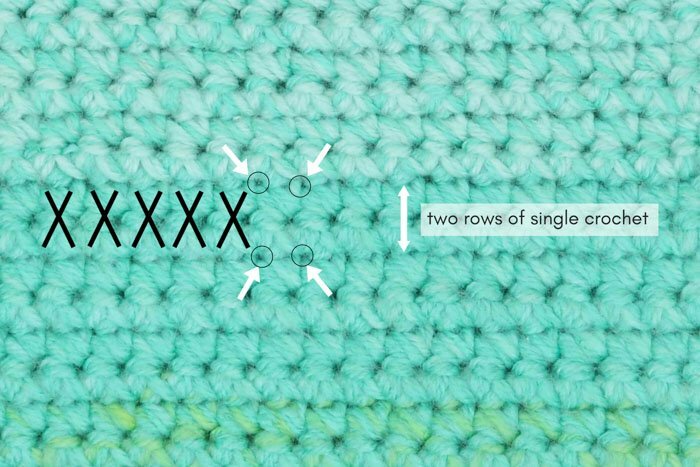 When designing your cross stitch graph, you’ll need to decide if each square in the graph will represent one or two single crochet rows. In the sample below, one stitch (width-wise) and two rows of single crochet are used to make each square in the graph design. So since this crocheted square is 50 stitches wide x 60 rows tall, the graph is 50 squares wide x 30 squares tall. This step in cross stitching on crochet just takes a little finessing and you can probably see now why the beginning swatch is pretty important. Instead of making the design with no regard to the fabric size or visa versa, it’s best to sort them out alongside each other so that you’re not limited entirely by your graph or your crocheted fabric piece. TIP: Try searching Google or Pinterest for things like “cross stitch fonts“, “cross stitch letters” or “cross stitch typefaces” to get inspiration for what simple letter styles can be built from arranging a few pixels. I’m not a cross stitch expert, but I figured out some tricks for making cross stitching on crochet easier. Start by placing stitch makers where corners of design will appear so that you can double check that you like the placement. 1. Thread tapestry needle with yarn you’ll use for the cross stitch design and knot so yarn is doubled over. This can be a contrasting color in the same yarn you used for the crochet fabric, or a different type of yarn altogether. Try experimenting with different weights of yarn. 2. Starting at one corner of design, insert needle from back of fabric to front of fabric. Work several diagonal slants of one row of design before working back in the other direction to cross your “Xs.” It will look better overall if you keep one direction of X slants on the bottom for the entire design and other direction of X slants on the top for the entire design. Continue in this manner working row by row for a vertical section (like one letter of the design if it’s a word) and then transition to the next vertical section. You’re sort of like an embroidery machine when you’re doing this and you’ll find a rhythm that works for you. 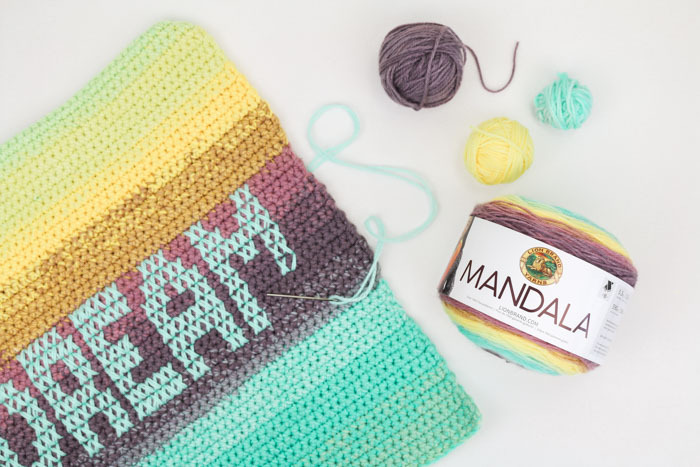 You’ll find that the back of your crochet cross stitch project might look a little messy, but that is totally fine as long as the back is hidden inside a hat, pillow, bag or something similar. 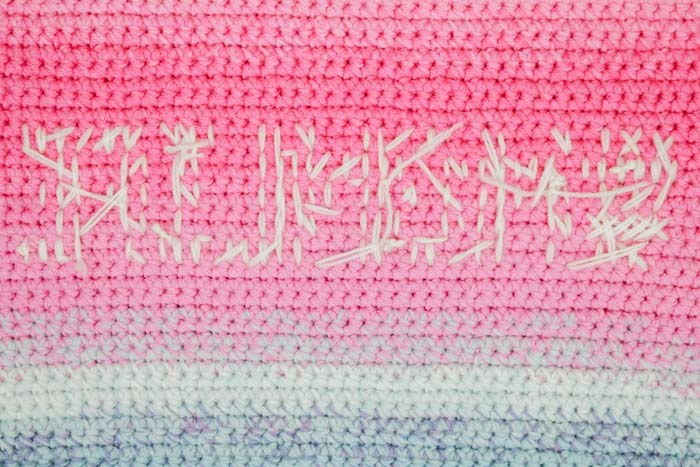 This cross stitch on crochet technique is probably not going to work well on something like a blanket, where the back of the project will be visible often. 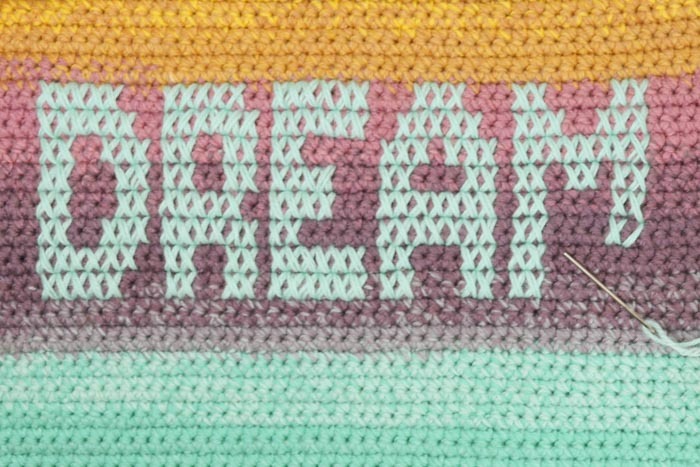 How do you plan to combine cross stitch and crochet? I’d love to hear in the comments. And if if you have any questions about designing your own graphs, please feel free to ask! And if you’d like to save this tutorial for later, you can pin it here. 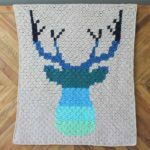 If you like learning new crochet techniques or trying new materials, here are some free patterns and tutorials you might enjoy. 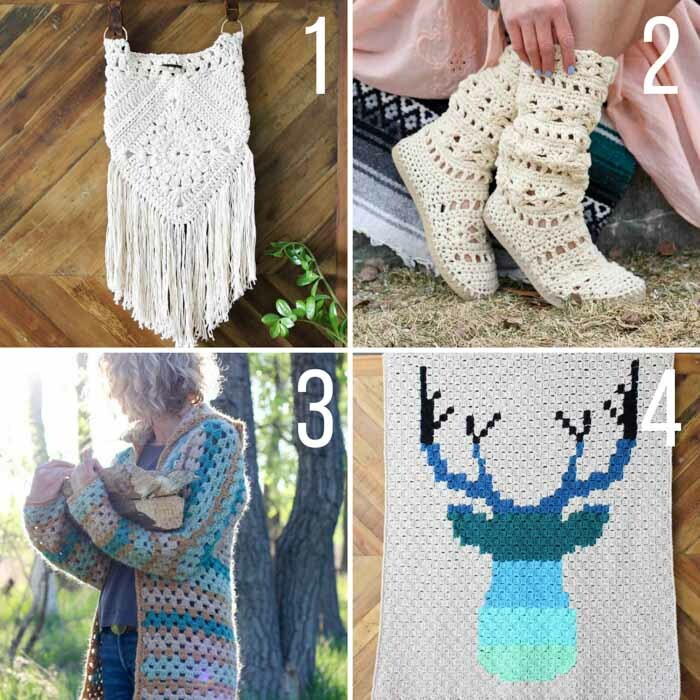 You can always find all our free crochet patterns here!